Broccoli slaw and cashews bring the crunchy to this easy (and better-for-you) chicken salad tossed with poppyseed dressing. Combine all ingredients except dressing and nuts in large bowl. Top with nuts just before serving. 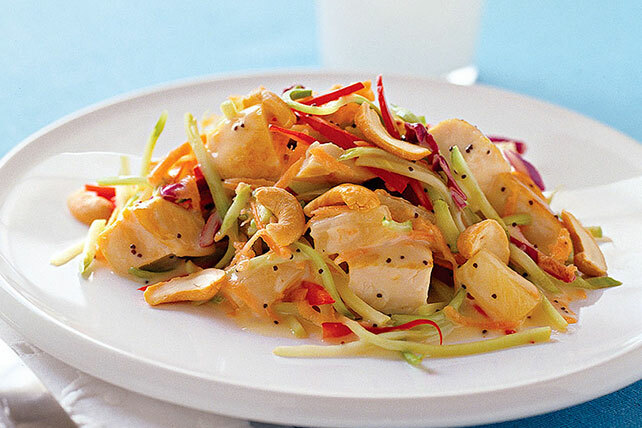 This main-dish salad provides 1-1/2 cups of the recommended 2-1/2 cups of vegetables per day. Substitute 1 cup chopped cooked chicken for the packaged chicken breast. Substitute PLANTERS Sliced Almonds or PLANTERS COCKTAIL Peanuts for the cashews.